Covering a total geographical land area of 112,090 sq. km, Honduras holds a population of 7.3 million. Adopted on March 7, 1866, the flag of Honduras features three horizontal bands of blue, white, and blue. Centered on the white stripe in the middle are five, five-pointed stars forming an H.
prominent groups, centered in Copan near the border with Guatemala, and lasted for many centuries, from around 150 AD to about the 1200s, with the civilization's decline beginning around the 9th century. In 1502, explorer Christopher Columbus arrived in Honduras, followed by other Spaniards who arrived in 1524, and settled and conquered the land. Despite resistance from the natives, the region, along with neighboring Guatemala, became a province of the Spanish empire, as the Kingdom of Guatemala. Spain never fully conquered the region, however, with holdouts in the east. The lands and the people of Honduras were used for mining operations, for gold and silver in the mid-1500s. Honduras declared independence from Spain in 1821, joining the First Mexican Empire, which soon became the United Provinces of Central America. Honduras later joined other variations of Central American federations, until they proved unsuccessful. In 1838, Honduras became an independent republic, though it has since experienced political instability and many rebellions. In the 20th century, Honduras was a point of focus of US produce companies, leading to a rise of banana plantations and other production. This foreign influence led to Honduras taking on a greater role in international politics and conflict, including a border battle with El Salvador. The 21st century brought a crisis including an illegal military coup, according to the UN, in 2009. 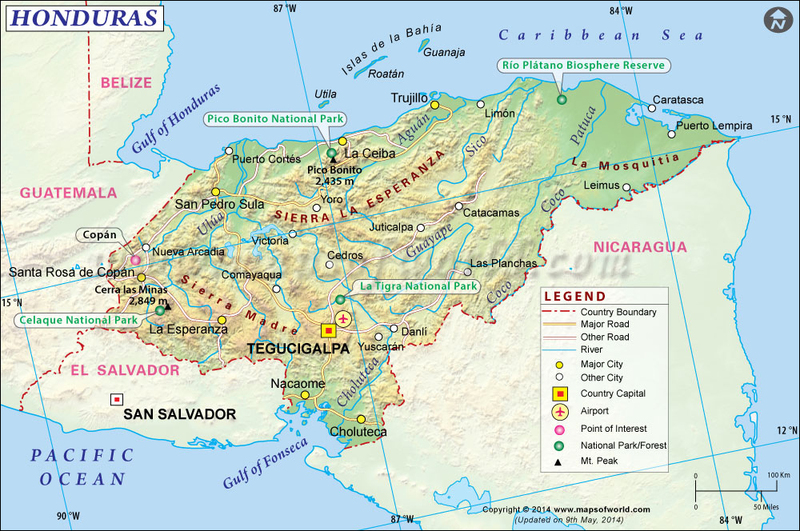 Honduras is bordered by Guatemala, El Salvador, and Nicaragua, as well as the Pacific Ocean at the Gulf of Fonseca, and the Gulf of Honduras leading to the Caribbean Sea. 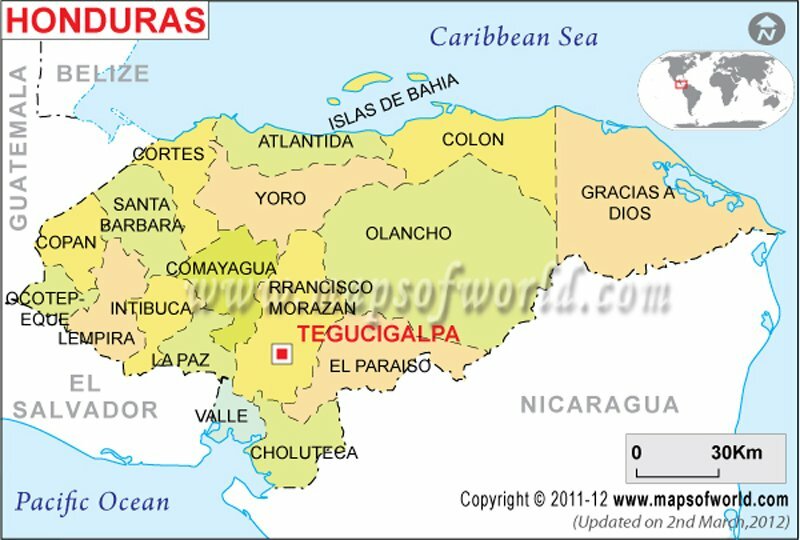 Honduras has northern and southern coastlines, the north along the Caribbean Sea and the south on the Pacific Ocean at the Gulf of Fonseca. Along the Nicaraguan border, the Coco River (or Yara River) flows from San Marcos de Colon out to the Caribbean Sea. The longest river in Honduras is the Patuca River, which is 500 kilometers (310 miles) long. The territory of Honduras also includes a few island groups, including the Islas de la Bahia (Bay Islands) and the Swan Islands along the northern coast of the country. The terrain of Honduras is mountainous with coastal plains and the jungles of La Mosquitia, in which the Rio Platano Biosphere Reserve protects the natural plants and animals of Honduras. The capital, Tegucigalpa, offers museums holding some of Honduras' historical art and artifacts, like the National Identity Museum and the Archaeology Museum, as well as several parks with scenic views. For some of the Mayan history of Honduras, head to the Copan Ruins, which feature sculptures and art from the Mayan civilization and the ancient ruins of the city of Copan. On display at the site are hieroglyphics and artifacts, as well as Mayan temples. La Ceiba offers the Cuero y Salado Wildlife Refuge, pineapple farms, and beaches, as well as Carnival celebrations that are considered the best in the region. Cusuco National Park is located near the city of San Pedro Sula, which is currently considered a very dangerous for its high violence rate. Roatan is the most developed of the Bay Islands in the Caribbean Sea, and offers resorts, beautiful beaches, gardens, and caves to explore, as well as water sports, including scuba diving and fishing. Honduras is accessible via flights into its main international airports, which are Tegucigalpa and San Pedro Sula, as well as Roatan and Le Ceiba. Its two coastlines and islands offer several ports, including Puerto Cortes and the Bay Islands, where visitors can arrive via cruise ships and boats. Paved roads into Honduras are available from Guatemala, El Salvador, and Nicaragua, though the road conditions are not always safe. There are also many bus services to get between major cities including international cities, like Guatemala City, San Salvador, and Managua. Most of these buses arrive at San Pedro Sula. Trains are also a potential method of transport, with some rail service to major cities, and to attractions like Parque Nacional Cuero y Salado.